At number 16 in Rolling Stone Magazine’s list of the 500 greatest songs of all time is “I Want to Hold Your Hand” by The Beatles. This song was recorded in October 1963, and was the Beatles’ first number one in the US; released there in January 1964 and reaching number one at the beginning of February, about a week before The Beatles started their triumphant first US tour. In the DUK it would have gone straight in at number one in its first week, but went to number two instead because number one was already occupied by another Beatles song, “She Loves You”. 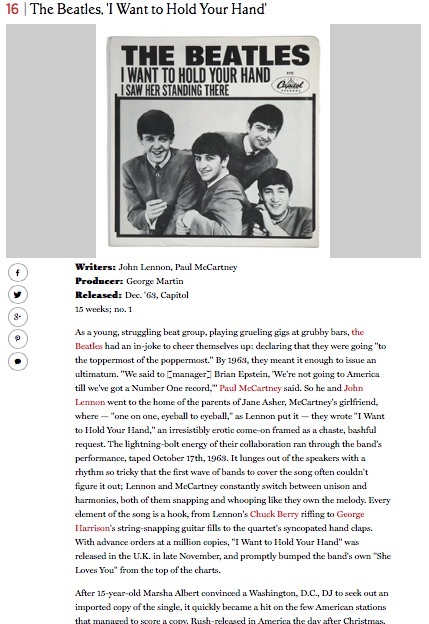 At number 16 in Rolling Stone Magazine’s ‘500 Greatest Songs of all Time’ is “I Want to Hold Your Hand” by The Beatles. For people who don’t seem to “get” The Beatles, I suggest you listen to this song. To me it epitomises why they were so groundbreaking – an apparently quite simple song with incredibly catchy lyrics, wonderful harmonies, and a great driving beat. But, as you dig deeper, there are really very complex musical patterns going on just below the surface. The hook is just that, a great hook that you can’t get out of your mind.